The Final Round of March Mayhem 2014 is finally here. Two developers enter, one leaves a winner. 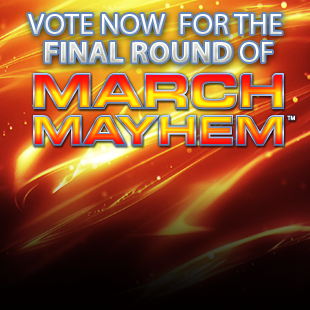 We've finally made it to the final round of March Mayhem 2014. You've narrowed it down to two competitors, and now we're in the final stretch. This is where we crown the winner of the whole thing, someone is leaving this competition a champion. You get to pick who exactly wins it all. You've eliminated fourteen developers, some of them independent and some of them AAA. Major developers have fallen at the hands of some less than major creators. Lucas Pope surprised everyone when he defeated GameFreak and Galactic Cafe, creators of Pokemon X&Y and The Stanley Parable respectively, but in the end lost to Firaxis. Telltale Games met some stiff competition in the early rounds in former winner Mojang and Tim Schaeffer's Double Fine, but in the end lost out to the powerhouse Valve. Ultimately we're left with Valve and Firaxis, both AAA and both March Mayhem finalists. Don't hesitate, make sure to get in there and vote. The final round of voting has begun! Vote now for maximum enjoyment. If you don't know who you should vote for, we suggest that you get into the forums and discuss who exactly should be the recipient of your vote. Valve, already a two-time winner of March Mayhem, is making their appearance once again in the finals. They defeated a company that doesn't exist anymore with Irrational. They then faced another two-time winner in BioWare and came out as victors. In the previous round they met and beat Telltale Games, a fierce competitor that had their own share of upsets. Now they're up against the powerhouse that is Firaxis. Valve's competition is pretty stiff this year with Firaxis. In 2013 Firaxis came out with XCOM: Enemy Within, which was more popular than The Beatles, at least around Escapist HQ. This year they've met some pretty stiff competition with Nintendo in the first round. For most developers this would have been the kiss of death, but not for Firaxis who rolled over the powerhouse. They then met with Volition, the creator of what some consider to be the game of 2013 in Saints Row IV, but alas Volition was not up to the competition and lost handily to the underdog. Lucas Pope was their next competition, he was considered to be the Indie developer that could but in this case couldn't take Firaxis. They now meet Valve, an odds on favorite, in the finals.